The second challenge that credit unions face is in leveraging the data they’ve consolidated into their single sources of truth. Typical credit unions do not have enough data on their own to do meaningful predictive analytics. Combine the lack of data resources with the different ways credit unions store and understand their data, and you have a significant hurdle to predictive analytics. Just as before, it’s not always enough to have the data if you can’t use it. Especially for smaller credit unions who don’t generate enough data to perform meaningful predictive analytics, data pooling and collaborative analytics is the key to true credit union data integration. Sharing data can be difficult too—like we mentioned before, all systems have different ways of storing and understanding data. That problem is only compounded when trying to integrate data from other credit unions’ systems. Credit union digital transformation affects the industry as much as it affects individual branches. 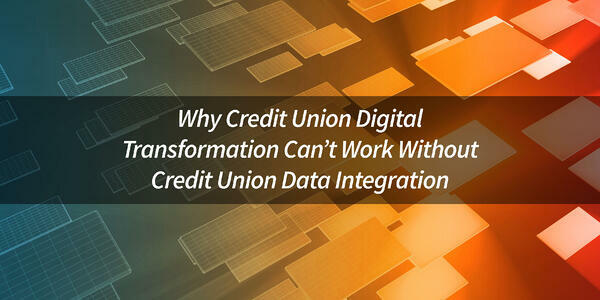 Consequently, all credit unions have some stake in improving their data integration capabilities. While sharing and understanding different data systems from different credit unions would be difficult for any data scientist, there’s an easy solution. Seamless collaborative analytics can be accomplished by moving to a common standard. If credit unions find a data pooling platform that allows for robust data integration, they can perform collaborative analytics. Their information sets will be augmented by those of their peers. Credit union digital transformation is as much a cultural, collaborative transformation as it is a branch-specific one. Unfortunately, credit union digital transformation is a time-sensitive proposition. The financial industry moves quickly, and in order to keep from going the way of the dinosaur, we need to take action.